Camouflage: it's been dressed up and dressed down, but one thing is for sure - it isn't going away anytime soon. From Coachella and Amiri to Fashion Nova, camo seems to have taken over street style and plenty of celebrity wardrobes. To understand how camouflage impacts us now, we have to look at the history of the print. 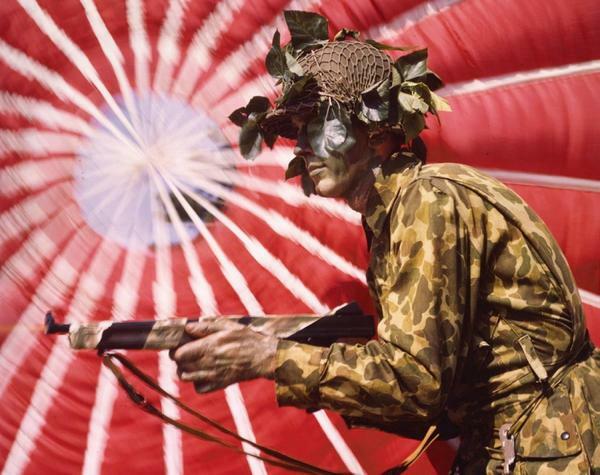 Camouflage was used during World War I to hide buildings and military vehicles from aerial attacks. Then camouflage uniforms were given to US troops in World War II. It became popular in civilian clothing in the 1940s, and in art and political statements throughout the rest of the century. The fashion industry helped change camo from a print that was once used to conceal to a print used to make bold statements. This print has had a huge impact on American culture. Fast forward to 2017 and almost everyone has at least one article of clothing in their wardrobes that is camouflage. Although at first glance, camo print can seem overrated, the numerous ways to style it make it hard not to love. All the fashion girls and boys are wearing camo pants. These androgynous, loose cargo pants aren't just army green however, they come in orange, grey, yellow, pink, purple and just about any other color you can imagine. It's not just pants that are all over stores - oversized camo jackets and accessories are also selling out. More great ways to incorporate camo into your look include everything from dresses and skirts to shirts and shoes. How do you feel about the camouflage trend? Is it overrated or here to stay? Let us know your take in the comments below!